In the heart of the dynamic City lies the Edison Hotel in New York. 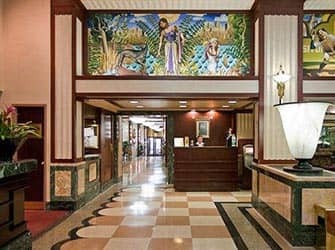 Sights; such as Broadway and Times Square are within walking distance of this hotel. 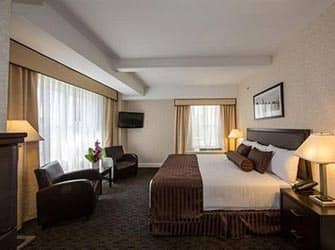 Edison Hotel offers a fitness and a business centre. In addition, the multilingual staff are on hand and more than happy to help. 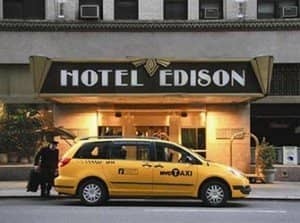 The Edison Hotel is right around the corner from Times Square and close to a lot of touristic hotspots. In the neighbourhood you have Rockefeller Center, Times Square and the Radio City Music Hall. You are also perfectly situated to see a Broadway show! Transportation wise, close to the hotel are a couple of bus stops, as well as a subway station where you can quickly and easily get to the other side of Manhattan. 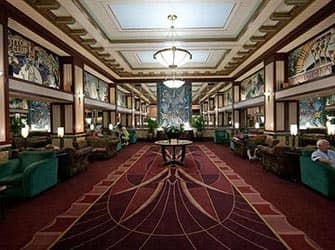 Edison Hotel in New York has a variety of rooms and suites for between two and four occupants. All the 900 guest rooms have their own bathroom which has a bath and a shower. 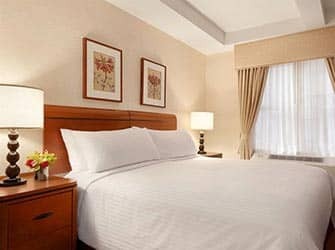 In addition, all rooms are equipped with air-conditioning, hairdryer, iron/ironing board, desk, telephone and radio alarm clock. A useful amenity is that you can make use of the wireless Internet, although there is a fee. The hotel is one of the city’s older hotels, but the price / quality ratio is pretty good.